Email or call for postage quotes. The StellaCam III has a very simple-to-use wireless controller option that gives the user complete automatic exposure control for up to 90 minutes! 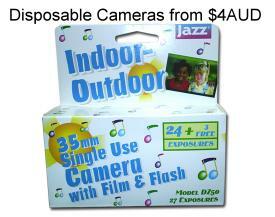 - including a 1 second resolution for exposures up to 5 minutes long! This ability allows the StellaCam III to go much deeper than is possible with the Mallincam (2 min max) - plus it allows you to "fine tune" the exposure time to match your Mounts capability. The Wireless Controller also provides complete computer control of the camera via a standard RS232 port (or USB port with adapter). Because it is monochrome, the Camera receives three times higher resolution - plus you can shoot through narrow band filters, like Ha or OIII with much better results than the Mallincam. The StellaCam III provides a true linear image output, not a DSP processed output like the Mallincam provides - which falsely enhances the image and introduces artifacts. The StellaCam III is also not plagued with the excessive amp-glow problem that the Mallincam exhibits for long exposures. 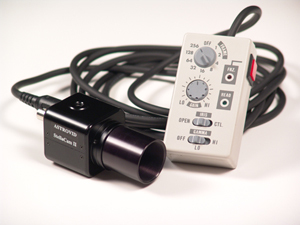 The Cooled StellaCam III has a much more effective "deep" cooling system based on a computer controller with real temperature feedback from the CCD to accurately regulate the CCD temperature - not a motion detection triggered "mild" cooler like the VSS that only activates the cooler when thermal noise is detected. And if you want colour images from the StellaCam III, you can still shoot through RGB filters to achieve very nice colour images with three times higher resolution than the Colour Mallincam. The StellaCam III is also much smaller and lighter weight than the Mallincam, with a Wireless Controller option (not available with the VSS - or any of their cameras really). We do plan on advancing the astro-video technology with future developments. 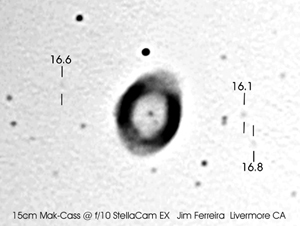 "StellaCam II Small Telescope Review"
� and see more than you ever imagined possible! 1. Faint Fuzzies are history! 5. 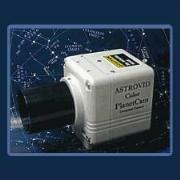 A Planetary, Lunar, Solar, and Deep Sky camera all in one. 7. Unique OPTIONAL Cooling System for artifact free images! 8. The result of 12 years of video camera research and development. Imaging System, Control Box, 1.25� C Adapter, 12V Regulated Power Supply. planetary mode at 1/60th of a second. perform very well with an image intensifying system such as the Collin's I Cubed intensifier. imaging, meteor imaging, camera lens imaging of aurora, very low light security applications such as in bridges, tunnels etc., biomedical and florescent detection applications. The Stellacam EX is strictly engineered to incorporate "Clean Video Technology". Through the use of the proper components you'll get the highest quality images that are free of noise. specifications, it is rejected. What's more, a large number of components is kept on stock at AVA in the rare event that a repair or replacement is needed. shielded and grounded to prevent any interference and has both S-Video and Composite Video outputs. get tangled in the drives. This is especially important in robotic or observatory systems where the imager is not close by. have lost much of your image quality and the amount of grayscale information for image processing has also been lost. will lose a great amount of gray scale detail. 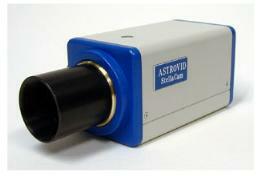 The Astrovid StellaCam and StellaCam EX use the 10 bit converter. This provides 4 times more gray scale information or 2 bit more data. 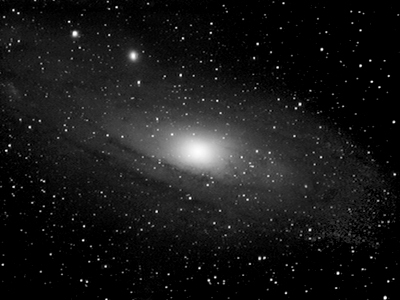 The result is a very brilliant image with 4 times more grayscale than conventional security CCD cameras such as the PC232.